Today is often referred to as “Pi Day”, since in the United States and various other countries, the date March 14 is written as 3/14. Beyond those who write the date 14/3, there are a few who object to Pi Day for other reasons. For pedants who want to point out that 3.14 is not actually equal to pi, you’re right. However, note that the difference in numerical calculations is 0.05%. (The real pedants will also point out that in Greek, “pi” is pronounced “pee”, but nobody wants a “Pee Day”.) So, because I am not a complete curmudgeon, I dusted off an older mathy post and updated it. 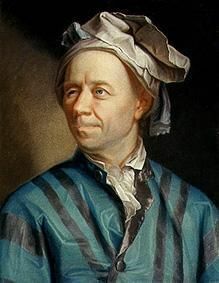 Leonhard Euler, one of the greatest mathematicians of all time. He also contributed to physics, astronomy, and the fashion of wearing boxer shorts on his head. Nobody can write about the history of science and mathematics without eventually bringing up Leonhard Euler (1707-1783). (Most Americans end up pronouncing his name like “oiler”.) So many important findings in math and physics that it’s hard to list them all, so I won’t try. I don’t really want to write a biography of him anyway: I just want to focus on one profound equation he discovered, and follow where it leads into some other interesting math…and of course physics. So maybe you can see why Euler’s equation is a bit unexpected: e and π are real irrational numbers. (Irrational means these numbers can’t be expressed as the ratio of integers; integers are the whole numbers 0, 1, -1, 2, -2, 3, -3, etc.) Including i in the mix naïvely should yield a complex number, but it doesn’t: combining e, π, and i gives the negative integer -1.
and so on, which is significantly larger than 1, and a positive number to boot. In fact, you won’t ever get a negative number by raising e to a real number. Try these in Wolfram Alpha: exp(-10), exp(-1), exp(0), exp(1), exp(10). Something weird and cool happens when you include an imaginary number in the exponent, and Euler realized after some careful computation what was going on. Illustration of the complex plane: the connection between complex numbers and points in two dimensions. 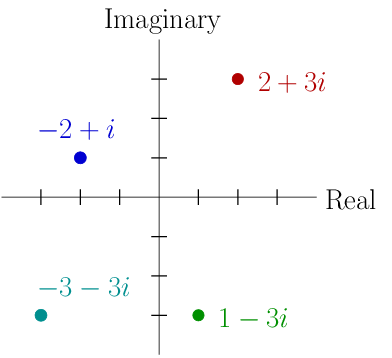 Four points are plotted so you can see the correspondence between x and y coordinates and the real and imaginary parts of the complex numbers. Rounding makes these numbers not quite equal, but if you include more and more digits while running , reaching ever higher levels of precision, you find that the sum is exactly equal to 1. You’ll also find this is true for other similar expressions like : you get a complex number, but if you square the real and imaginary parts, they add up to 1. Pi and its integer multiples are special, though: yields a real integer if is any integer: 0, -1, 1, -2, 2, etc. Relating a circle to complex numbers. The radius line (in blue) has a length of 1, and we’ll use that as the hypotenuse of a triangle. Then the x- and y-coordinates of the end of the line are given by the cosine and sine of the angle θ as shown. 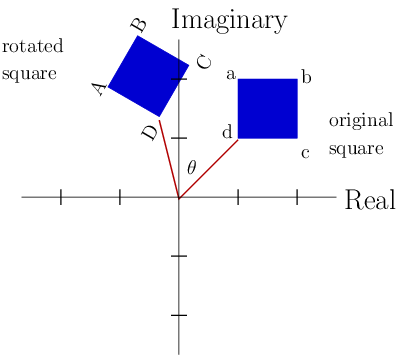 The standard trick in math is to associate the x– and y-axes with the real and imaginary parts of a complex number, so that the angle between the blue line and the x-axis, marked by θ, is the same as in Euler’s formula. The x-coordinate is the cosine of the angle, and the y-coordinate is the sine of the angle. Properly, we need to write the angle in radians, not degrees: one circle (360°) is 2π radians, so a half-circle (180°) is π radians. Looking at the circle above, you can see that an angle of π corresponds to x = -1 and y = 0, exactly what Euler’s formula predicts! where r is a real number representing the radius of the new circle. 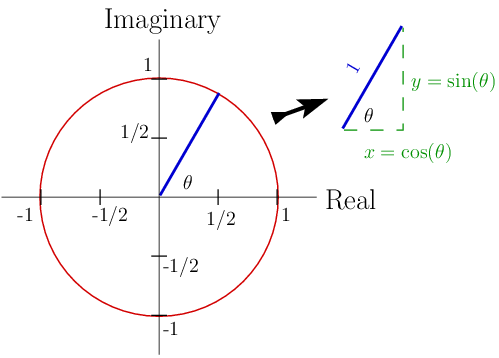 Instead of writing the real and imaginary parts of the complex number like x– and y-coordinates, we can use r and θ, which are known as polar coordinates. The angle θ is also known as the phase of the complex number, and r is its magnitude. That’s a very simple formula, and makes doing many calculations with complex numbers quite easy. Rotating a square using complex numbers: write the coordinates for each corner as complex numbers. Use Euler’s formula to write a complex number with the angle you want to rotate. Multiplying “a” by the rotation factor gives you “A”, and so forth. Despite how it may look, each corner is the same distance from the axis of rotation before and after. For the example image, I used radians (or 60° if you prefer, but it’s Pi DAY so use the friggin’ radians already). and so forth, as in the picture. It’s endlessly fascinating how many places π shows up where you don’t necessarily expect it. However, once you’re attuned, you realize its ubiquity is because geometry hides in many places: the spiral of shells, the strength of gravity, the fluctuations of waves. Pi is an interesting number, encoding a deep connection between many apparently disparate areas of the natural world.